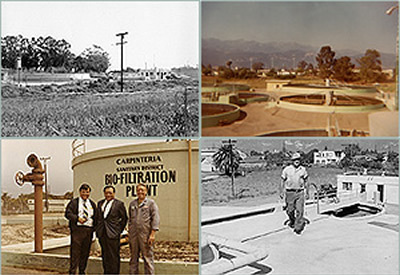 The Carpinteria Sanitary District was formed in 1928 to provide wastewater collection and disposal to area residents. During the 1930’s and 40’s wastewater was collected and discharged to the ocean without the benefit of treatment. It was during this period that the bulk of the sewer system serving the downtown area was constructed. The District’s first wastewater treatment plant, designed to treat 500,000 gallons per day, was completed and put into operation in 1951. Treated effluent was discharged directly into the Pacific ocean via an 18″ outfall pipe which ran along the eastern bank of Carpinteria Creek. As the community grew so did the sewer collection system and the treatment plant. In 1961, the treatment plant was expanded and upgraded to a capacity of 2.0 million gallons per day which included a new, longer outfall pipe, primary clarification, trickling filters, final clarification and anaerobic sludge digestion. This facility served the community well for over 30 years. In 1993 the District completed another major upgrade to its wastewater treatment plant that involved replacement of the majority of the process infrastructure. This project was funded through issuance of revenue bonds that are being repaid by sewer users. The current treatment plant includes preliminary screening and grit removal, primary clarification, extended aeration biological treatment, final clarification, chemical disinfection, aerobic digestion and odor control systems. The current plant capacity is 2.5 million gallons per day and dry weather flows have been averaging 1.4 million gallons per day in recent years. Over time, the District’s wastewater collection has been expanded to serve the community’s needs. The system currently consists of approximately 42 linear miles of sewer pipeline ranging from 6″ to 24″ in diameter. The District also owns and operates eight sewage pump stations that are necessary to convey flow to the wastewater treatment plant. Currently the District provides service to approximately 16,500 people and has approximately 4,300 user accounts.